I remember the first day that I switched to all natural deodorant. I was teaching at a music studio in the middle of a sizzling hot midwest summer and we lost power. Students were given the option to go home and reschedule their lesson or stay and learn by the light of our iPhones (until they ran out of batteries). Every single one of my students chose to stay. As the hours wore on it became hotter and hotter and I was painfully aware of how small the lesson rooms were. You guys. I STUNK. My Tom’s of Maine all natural deodorant WAS NOT WORKING. I kept going with it for a few more weeks because that obviously wasn’t the typical scenario. Even my old aluminum and artificial fragrance containing deodorant probably wouldn’t have held up. After a month had passed I ran out of excuses. It was a month of my family making comments about my natural scent; a month of being unable to wear anything remotely form-fitting; a month of being nervous about having to be in close quarters with anyone. My body had plenty of time to adjust, and it just was not working. I tried a different brand and had the same problem. I thought well, being smelly is better than getting cancer from aluminum, so I’m just going to deal with it. AND THEN. A friend of mine introduced me to a deodorant that changed my life. This stuff is so amazing, I can actually go two days without reapplying (I usually only get time for a shower every two days anyways). IT IS AMAZING. More about that in a few. There are many studies out there that prove that aluminum (the active ingredient in deodorant) causes cancer and Alzheimer’s. There are also many studies that disprove this theory. Do you ever feel like you just don’t know what to believe? I’m not a scientist, so I make the best decisions I can with the information I have. The decision to throw out my deodorant and try a new one came as I was breastfeeding my firstborn. I was painfully aware of how close his tiny face was to my armpit. The thought of anything that could possibly cause cancer, or even irritate his skin, being so close to his face, was very scary to me. I immediately switched to an aluminum-free deodorant and a fragrance-free lotion . Nothing bad can come from using all natural products, and you are potentially saving yourself from a lot of harm. I’m going to tell you MY FAVORITE products that WORK FOR ME. Products react differently on different bodies. If something doesn’t work for you, don’t get mad at me. Just send it back! Whenever I try something new I get it from Amazon Prime and if it doesn’t work I exchange it for a different product. These are in order of when I tried them first, not preference! 1. PiperWai : This stuff has charcoal as an active ingredient, which absorbs moisture. It works so well on me, and I have suggested it to many people who love it. I do have one friend who tried it out and said it didn’t work on her. If this happens to you, try out another one that I mention below. OK, now the bad part! $$. It’s $15. Another con is that you have to apply it with your fingers, which is pretty annoying. It doesn’t bother me and is totally worth it for how awesome it works. Piperwai is also available at their website, www.piperwai.com, however you have to pay shipping, so it ends up being the same price as Amazon. They just released a stick that I’m really excited to try. I came across a new deodorant called ArmPit Armor while I was getting the link for PiperWai. I haven’t tried it yet, but it uses charcoal as the main ingredient, just as Piperwai does, and it comes on a roller so you don’t have to use your fingers. It’s also just under $13, and .1 oz bigger, so it’s a better deal. I might give it a try and I’ll update this post if I do! If you try it out, let me know how it works! 2. Primal Pit : Pros: This is available in both a stick and a paste. The stick is hard to apply and you really need to rub it into your armpit with your fingers to make sure there are no white clumps. I much prefer the paste, and I’m not bothered by the fact that I have to use my fingers to apply it. Primal Pit works just as well on me as PiperWai, and it is available in different scents. It runs about $10 on amazon and has become my go-to! 3. LAVANILA : My friend who hated Piperwai swears by this. It’s about $13 on Amazon and has a fantastic scent. While it did work really well for me, I found that I had to reapply in the late afternoon or I started to stink a little bit. I have no time for that! I do love that it comes in a stick, making it easy to apply. They do have a Sport Luxe version that might be a little stronger. I might give that a try and let you guys know how it works! 4. Schmidt’s: This has become my favorite that I use 100% of the time! It comes in a variety of scents, but the Bergamot Lime is my favorite. It comes in a stick (hallelujah!) and it works SO WELL. I will never go back to chemical-filled deodorant after using this. I used it all summer long and never had an issue. Do give your body a few weeks to adjust, especially if you are switching from a conventional, aluminum containing deodorant. If you have to reapply, this does not mean that it’s not working for you! I don’t usually have to reapply my Piperwai or Primal Pit; however, there have been a few days that have been really hot and I was fairly active and by the end of the day realized I could have benefited from a reapplication. 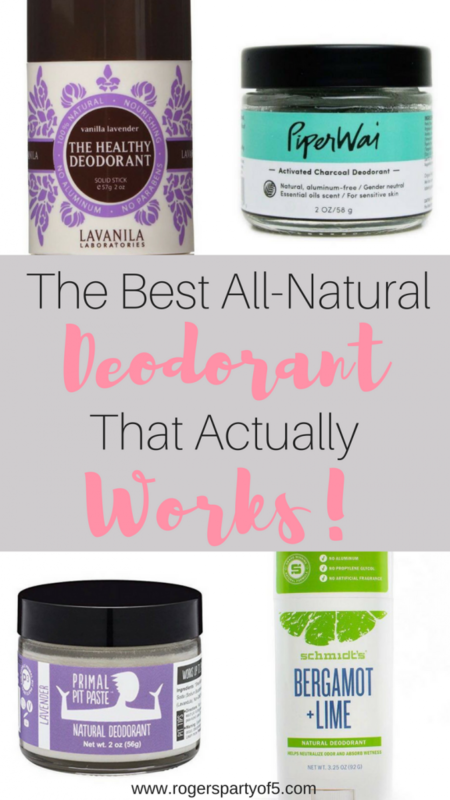 These are the top 3 all natural, aluminum-free deodorants that I have tried. There are a million more on the market, so hopefully, this will make your switch a little easier! If you like this post, check out my post on The Best Skincare Products for Busy Moms. I’d love to hear from you if you’ve tried something else!